This is our largest cabin. It sleeps 7 people in 5 single beds and 2 bunks. 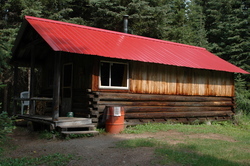 It‘s the cabin closest to Flapjack Lake (about 200 meters). Its also the most secluded cabin.